After a little lull in deliveries, three more cards for my 1998-99 Skybox Autographics chase (taking the total to 91 cards), arrived in the mail this morning. As is often the case when I am adding slightly lesser known players to the set, I find myself doing a little research on them, to find out how their careers panned out. 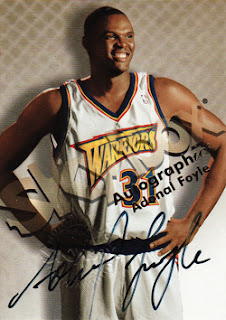 Whilst both Reggie Slater and Adonal Foyle had strong carers that lasted 8 and 12 years respectively, the 'journeyman' career of point guard Anthony Johnson jumps out at me. 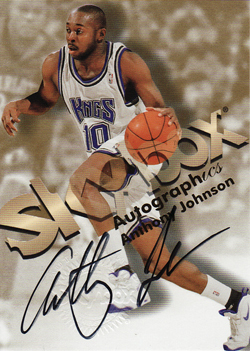 Johnson joined the league in 1997 after being drafted mid-way through the second round by the Sacremento Kings, with the 39th pick. Now clearly the standout players from the Class of '97 are Tim Duncan, Chauncey Billups and Tracy McGrady who are all still active and will finish their careers have played over (or in the case McGrady close to) 1,000 games when they finally retire from the game. Johnson then though finds himself in the next group accompanied by the likes of Anthony Daniels, Tony Battie and Tim Thomas, having played just under 800 games during his 13 years in the league. Although far from unique for a player of his abilities, Johnson played his trade in Sacramento (twice), Atlanta (three times), Orlando (twice), Cleveland, New Jersey, Indiana and Dallas. 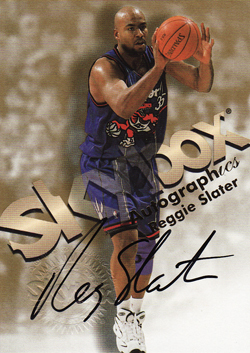 His career stats ended with him averaging 5.6ppg from just under 20 minutes per game, during which, for the most part, he featured as the back-up point guard on each team he played. I would be particualrly interested to hear Johnson's view on his career and specifically his personal highlights from a career, with total earrings that topped just over $19 million. He was on the roster of teams that reached, but lost, the NBA finals on three separate occasions. He was with the Nets in 2002 & 2003 and the Magic in 2008, but only played during his first two visits to the finals, being unused in the final series. In 2008 his then coach Stan Van Gundy said of Johnson that "His professionalism, his work ethic, his toughness are the reasons that he's' had the lengthy career that he's had. He's a competitor." Owning a card that has hand signed by such an athlete and actually only cost me $5, is one of the simple pleasures to be gained from of this hobby. Was a big Anthony Johnson fan while he was in Indiana. True professional and was one of the better backups in the league.